Seriously, with such a poor turnout on this book give-away contest I feel like I’m throwing a birthday party and nobody showed up. What up with that? And I’m offering some pretty darn good books! What. Ever. Ok. I want to talk about non-fiction. I don’t read very much non-fiction. Mostly cookbooks and memoirs. Sometimes some books about alternative health. Once upon a time I read a lot about birth and breastfeeding and child rearing. I’m not averse to non-fiction, just not drawn to it. I’m giving away two books that look extremely interesting but I know I won’t read. The first is The Happiness Project, by Gretchen Rubin. I’m way too content being a curmudgeon for this book. Gretchen also blogs at http://www.happiness-project.com. The second book is an ARC of An Accidental Athlete, by John Bingham, a memoir about a guy who “finds his mojo and becomes an adult-onset athlete.” Personally, I’d rather eat cookies on the couch and read. Both books interested me enough to shlep them home on the train with all the other tote bags full of swag I got from Book Expo. 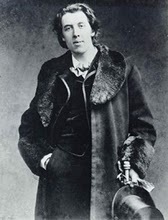 I think my coolest take-home though was an Oscar Wilde action figure... I know. Be jealous. Have you ever had a birthday party where nobody showed up? OK… I know I am not qualified to receive because of the nepotism rule. But I will still continue to lurk and comment. Rule 1. Patience is required. Edison tried over a thousand times before he perfected the light bulb. Keep on blogging, keep on making offers. If you build it…. they will come. I wanted to win the Ann Enright book! But I was away and couldn’t figure out how to do it on my cellphone. I’m assuming it’s too late. AND the Hugo Cabret book is a big favorite in our house. My son Alex, who abhors reading, loved that book. It was so beautiful. I can’t wait to buy him the next one. We can talk about the Ann Enright…it is still up for grabs. Go to that post and make a comment! Why do you think Alex loved Hugo Cabret? Just because of the pictures? Does he like to read graphic novels? Or was it something else? I showed up to your last party and won a prize – looking forward to getting it. My home library is bursting at the seams, so I give most new books to my local public library, after I read them. Since I’m trying my hand at writing pre-school books, I hope you have a contest for that genre too. I also donate books to my local library. I’ve given them some ARCs of YA books for the teens to “review” for our library newsletter. It’s kind of cool how they get all jazzed up about it. I don’t think I’ll be doing a pre-school book contest, but if you refer 5 more people to subscribe to this blog I’ll go out and buy you my favorite board book! Yes, that’s right, I’m pimping this blog. Shameless! Bahaha! I like your last option on the side as to why no comment. Reminds me of something Lucy of Peanuts would say. I heard everyone writes and no one reads nowadays. I am insecure about puctuation. WTH!:*&^%! Maybe people think it is a gimick! They will end up having to sell Amway or something. In any case I’ll leave you my Visa # for my monthly purchase and S&H of only $9.99. I have a hard time reading anything that is not useful info. I buy text books at yard sales. Reading for just fun seems so indulgent. I went through a self help period, then worked hard at getting into novels. Having little kids makes it hard to focus for long periods. Some days I only read to them. Maybe I ought to get something adult to read to them! Any ideas? My husband read The Hobbit to my kids when they were very young. He read for about 20 minutes each night and I think they had a “no interrupting” rule, or my son would have stopped him every other sentence to explain the exact meaning of a word. I also remember reading some classic or other to them when they were pretty little and when I got to a word that wasn’t exactly PC but would require more explanation than I wanted to give (probably because I was exhausted and just wanted the fuckers to fall asleep already) I substituted it with another, easily understandable word. Was that wrong?! And yes, having little kids definitely makes it hard to focus.